Jodie. Not bad but her costume seemed to not allow her to move her midsection. Feet and legs were a little muddled at times. Not enough bounce or hips. I'll give her the scores. Marla. A bit too staccato for me. A few wonky lines. A bit high for me. Geraldo. Awkward on so many levels. Too high. Paige. I liked it. Could've used more hips in the basic though. Props to do lifts with a new partner in 2 hours. I agree with the scores. Antonio. He didn't do anything and his knees were bent the entire time. No hips because he never had an opportunity to use them. Too high. Kim. She lost it a bit at the end. More hips required. That fringe should never stand still. I'll give her the scores. Nyle. I liked it even if he need to use his hips and I saw heel leads. It was pretty fast and spinny. Can I have her dress, maybe in a different color? I'll give him the scores. I barely got anything done last week and by the time I did have something to post it was Tuesday. So I skipped a week. 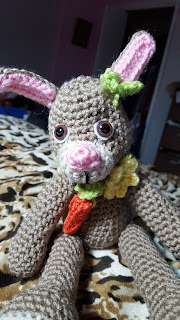 I finished another lamb and made a bunny. 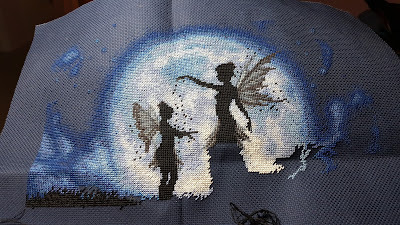 I managed to get a little done on Twilight Silhouette, but realized I had chosen the wrong color and had to rip out all of the half stitch black I had done. Lots of solid black stitching to come. Then Onyx decided to be a pair of shoes this morning. Kim. Better than I would've thought. May have had a heel lead during the lock steps. But it moved forward. Could've used more hips. Heels were a little low. And she's not annoying, so far. Unlike some other people from that show. I agree with the scores. Paige. Danced well but a little too fast and hoppy for a foxtrot. Song didn't help. Not much in hold. Not stiff like stiff of her male counterparts. I agree with the scores. Doug. Walked and hopped through the foxtrot. Won't last long unless he gets a lot better. Latin will probably be worse. I agree with the scores. Jodie. That should keep them around for a while. Frame needs a bit of work. I agree with the scores. Geraldo. Oh boy. Barely moved and it wasn't good. I forgot how long her legs are. I agree with the scores but I think they were generous. Marla. She has potential. Too straight in hold. Small little missteps. I'll agree with the scores. Almost didn't make a weekend update. Also almost didn't have anything to show you. I somehow ended up with no crafting time this week after work. 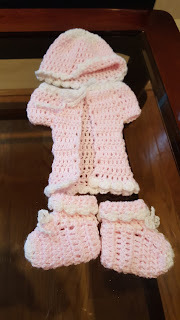 I did however make this as a gift on Saturday. And I'm halfway through another lamb. But right now I only really have a fuzzy white pear, two fuzzy circles, and a partially made head. And another season is upon us. Time to see who our cast is. While it's nice to know she's famous for something other than being his ex. I don't think he needs any more publicity than he's getting. She seems to be one of the younger women Tony has been paired with. I never watched this show, but nice to know Artem's back. I think this is a position that's good at running. So fitness level should be there. Quarterbacks usually have some agility and do fairly decently. although I'm unsure of how long he's been retired. So I caught a cold this week and stayed home a day. Good news is I had lots of time to stitch and catch up on TV. Still way behind on the TV, but I'm plodding along with Twilight Silhouette.